Dane Clement, founder and president of Great Dane Graphics, and Lon Winters, owner of Graphic Elephants, joined forces to compile their years of artwork and screen printing knowledge so you screen print killer black shirts. Operation Screen Print is a training series geared specifically toward screen printers. The first mission, Killer Black Shirts, teaches you everything you need to know. Create artwork properly, separate, and print positives for black shirts. Your mission won't stop there; learn how to prepare screens and work through the entire screen printing process. 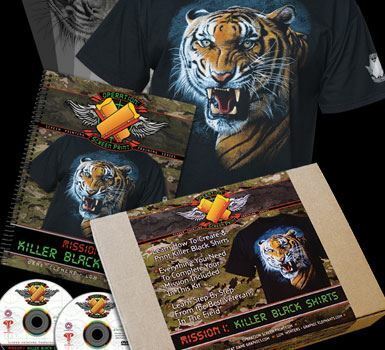 With a full color instructional book that includes step-by-step lessons, two disks loaded with tutorial movies, a sample black T-shirt, and 5 film positives to use as practice, get everything you need to stock your arsenal of knowledge and start shooting out killer black shirts.